Bonrix Software Systems is the leading Group Auto Dialer Software provider in INDIA. It commenced from the year 2001. 1. 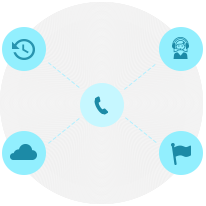 Mobile The Bonrix Auto Dialer voice module is about offering you the most effective way to manage how to contact your clients by telephone/mobile. 2. Because Bonrix Auto Dialer is cloud based it means your agents can work from anywhere. 3. In fact the only requirement in our product is that each agent has a number we can deliver the call to. 4. Your agent can log in and out to take calls over the web or even over the telephone. 5. We have developed an android app to ensure you are where your customers are. What is Bonrix Auto Dialer android app? We at Bonrix Auto Dialer have developed an android app to help you manage your campaign even more efficiently. Now, you can have agents working from home or any other location in the world. Call End then you can sent SMS. Telecaller Can See call details Of client. agents can schedule client call fix date and time.